'Bal maidens' at a Cornish mine photographed in 1905. Picture courtesy of Cornish studies library, Redruth. The Woman Worker will be of interest to historians, sociologists, political theorists and educationalists. But most of all it will be of interest to the women and men who continue in 21st-century Britain the struggle in their workplaces and in their communities for the defeat of capitalism and for a more just and equal society. Fresh and vibrant, it is as relevant today to our fight for women’s freedom from oppression and exploitation as it was in pre-revolutionary Russia almost 120 years ago. A quarter of a century after it had first been published, Nadezhda K Krupskaya revisited the pamphlet she had written in 1899 while exiled in the village of Shushenskoye in Siberia with her husband, Vladimir Ilyich Lenin. At the time she had not been confident that she could manage to produce what was to be her first pamphlet. Now she was being asked to agree to its reprinting and wide redistribution. Thinking that what it raised might be worth reconsideration in the post-revolution Soviet Union, she gave her consent, writing a brief reflective introduction. Looking back at the pages “paled with age,” it was clear how far things had moved forward following the taking of power by the working class in 1917. Conditions had changed in so many ways for the woman worker and woman peasant. “With each passing day, women workers and peasant women are becoming more politically conscious, self-confident and partaking ever more in the building of a new life,” she said. Yet so much work still remained to be done to enable women to achieve full emancipation. It is a testimony to the clarity and penetration of Krupskaya’s writing and the simplicity and contemporary relevance of her message that not a single addition or amendment was needed 25 years after she first put pen to paper. The work is set out in three sections. The first addresses the reality of women workers’ lives in the workplace, as members of the working class, and of the nature of the struggle of workers against the bourgeoisie in which women and men must be involved together. Thus, from the outset, Krupskaya asserts that the deplorable condition in which women labour under capitalism and their fight for freedom from this is fundamentally rooted not in gender but in class. 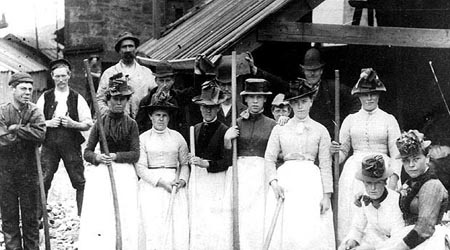 The second section considers women workers in the family, showing that women not only suffer as members of the working class but from the gender-based oppression arising from their dependency on men who keep them as property, shut away from society, poor, abused and without means of escape — because without men “bread-winning” for them, they could not survive. Krupskaya argues step by step that the independence and hence the freedom of women can never be achieved under the present capitalist order. “Thus, we see that a woman has a double interest in the workers’ cause — as a worker and as a woman,” Krupskaya argues. In the final section the writer looks at women workers in their role as mothers, burdened by poverty, drudgery and ignorance. She demonstrates that what is needed for the upbringing of cultured, educated, healthy children into citizens who value productive labour and social co-operation can only be provided when the current conditions are overthrown and society takes responsibility for the next generation — planning, dedicating resources and organising to meet all its needs. This is yet another compelling reason why women workers must fight with their class for a socialist future. The first part of each section sets out in graphic detail the situation and experience of women and, crucially, why it is as it is. Readers and listeners — for its simple message was clearly intended also for those who were illiterate and could not access the written word — encounter peasant women, those engaged in cottage industries, women in mills and factories, women used as chattels, women suffering at the hands of husbands in communities where abuse was endemic, women forced into prostitution, children sick and dying. The writing is reminiscent of Engels’s The Condition of the Working Class in England. As you read you see, hear, smell and taste the poverty and degradation. But this is only the starting point. Wherever Krupskaya takes you, she shows you not only why the material situation is as it is but also explains what workers need to do to change things and tells how it is possible to sweep away the old order and build something new. At the same time she tackles the ideological barrage to which women and men are daily exposed, setting out the arguments and challenges of those who consciously or otherwise stand in the way of change — the things they tell you at school and in church, what the supposedly “kind gentlemen” say. And then Krupskaya clearly and systematically refutes them. Women will get nothing from the tsar, the bourgeoisie or god! She draws her listeners in, skilfully bringing them close to workers already engaged in struggle, telling of the part women have played and the progress already made. She shows that another world is possible if, and only if, women and men struggle “arm in arm” together. The Woman Worker is especially valuable to us because of the insight it brings us of this truly remarkable woman and because not only was this Krupskaya’s first booklet, it was also the first Marxist work on the situation of women in Russia. Krupskaya was a revolutionary, a politician, an educator and an activist committed throughout her adult life to the cause of socialism. She played a leading role in the Soviet Union from the beginning, including in the setting up of the Komsomol and Pioneers and as deputy to the people’s commissar of education and enlightenment with responsibility for adult education. Finally, for the last 10 years of her life until her death in 1939, she was the deputy minister of education for the whole Soviet Union. The Woman Worker, written in the harsh circumstances of internal exile and published and distributed in secret under a pseudonym, testifies to the deep theoretical understanding and early promise of a very gifted and courageous revolutionary. The contribution she went on to make shows the importance to the movement of its recognition and fostering of that early potential. What might have been lost had the young woman not received the encouragement her comrades gave her? In 1933, Krupskaya wrote a preface to Lenin’s work, The Emancipation of Women. Here she details the achievements of the Soviet government which had been celebrated a year earlier, in October 1932 on the 15th anniversary of Soviet power. The new Manifesto Press publication includes Mick Costello’s translation of The Woman Worker and of Krupskaya’s introduction to the reprint of her work 25 years on. It also carries an introduction by Dmitriy Kolesnik and Alex Gordon, together with archive photographs. This must surely be one of the best short Marxist tracts to have been added to this corpus of literature in English in recent years. • Liz Payne is chair of the Communist Party of Britain and its women’s organiser. • The Woman Worker by Nadezdha Krupskaya costs £3.50 + P&P and is available from the Marx Memorial Library & Workers’ School, 37a Clerkenwell Green, London EC1R 0DU. Be the first to comment on "The Woman Worker (1899) by first published in English (2017) by Manifesto Press Co-operative Ltd (translation: Mick Costello)"